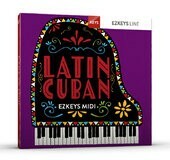 Toontrack presents Seventies Prog EZkeys MIDI, a new piano MIDI bank for EZKeys. The Loop Loft introduces Flipped Drums Vol 2, a MIDI groove library for use with your favorite virtual drummer. Toontrack has released Piano Pop EZkeys MIDI, a MIDI library played by professional piano player Martin Hall. Toontrack has released the Classic Rock Grooves MIDI pack, a new set of MIDI files for your favorite virtual drummer. The Loop Loft presents Pocket Drums Vol 1, a MIDI drum loop library for use with your favorite virtual drummer. Toontrack has released Pocket Grooves MIDI, a collection of MIDI drum files spanning anything from neo-soul to hip-hop, R&B, funk, fusion and pop. Toontrack has released Neo-Soul, a new collection of piano/keyboard-oriented MIDI files for EZKeys. The Loop Loft has released Epic Drums Vol 2, a collection of MIDI files for your favorite virtual drummer. Toontrack close their Country Month with the release of the Country Grooves MIDI pack, a MIDI drum library. Groove Monkee have updated their Punk MIDI drums library, adding BeatBuddy compatibility.